If You'd Asked Me...Child Guest Turns Up Nose at Dinner? If You’d Asked Me…Child Guest Turns Up Nose at Dinner? 25. 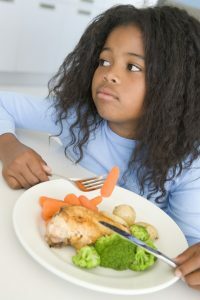 Was I wrong to not give a five-year-old guest child the food that she wanted? I had snacks (veggies, cuties, cheese, pretzels) and she refused it. She also refused the pizza because it had veggies. She later told her mom that she hadn’t eaten. Though five is a bit young to learn this, she should be made aware that it’s rude to refuse what is offered to you at the dinner table, especially when you’re a guest in someone’s home. The only time this is acceptable is when you are genuinely allergic to something—for example, shellfish allergies can cause anaphylactic shock in some people. But “I’m not eating because I want you to go out and get me a McDonald’s?” Don’t think so, kiddo! This entry was posted in If You'd Asked Me... and tagged feeding child guest, kids refuse to eat on July 12, 2018 by funny.